The German Sturmgewehr could be considered the world’s first real weapons system. 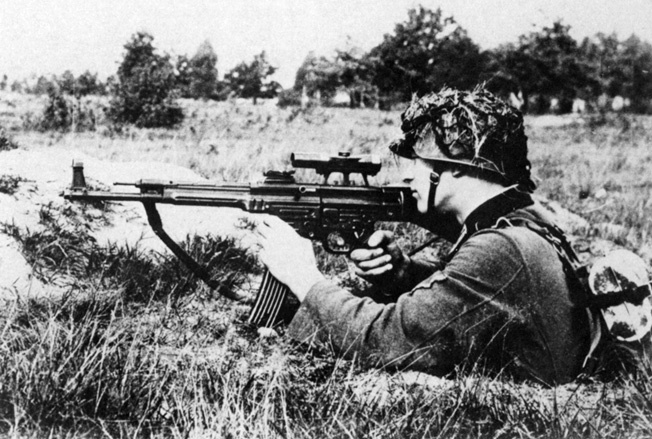 In action against the advancing Allies on the Western Front, a Waffen-SS soldier takes aim with a Sturmgewehr 44 assault rifle during the waning months of World War II. 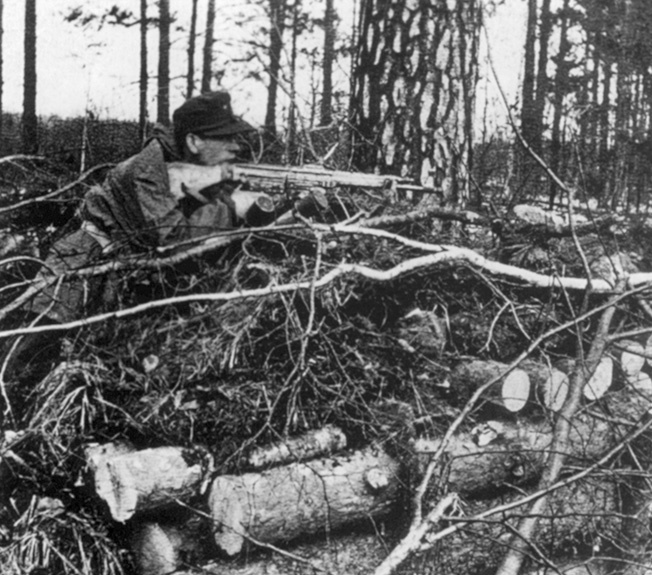 A German soldier tests an MP43/1 for suitability as a sniper weapon in October 1943. The first test in battle for this new weapon is often attributed to the defenders of the Kholm Pocket in February 1942, but in fact no Mkb42 had yet been delivered, let alone the MP-43. This was most likely the Gewehr 41 semiautomatic rifle. The first true field test of the newly designated MP-43 came in the spring of 1943 when troops of the SS Division Wiking were armed with it. The gun was an immediate success, displaying an impressive combination of firepower and controlability. The story that Hitler jumped for joy at the reports from his generals about the performance of this revolutionary battle implement, and in his glee immediately dubbed it Sturmgewehr, is also a falsehood. Ever skeptical, Hitler canceled development of the MP-43 and sought the opinion of frontline troops before authorizing limited production in late 1943. Even though the weapon, now officially christened MP-44 Sturmgewehr (although there was no functional difference from the MP-43), was produced until the end of the war, these initial authorization delays, coupled with recurring manufacturing and supply problems, assured that great enough quantities of the weapon would never be delivered to influence the fighting on any front. As with many of their inventions in World War II, the German high command sought to diversify the combat applications of the MP-43/44 as well. A small research and development industry of sorts sprang up around creating accessories that would allow the MP-44 to be used in a diverse number of situations. Probably the most bizarre of these inventions was a device known as the Krummerlauf, or “bent barrel.” This was a piece of calibrated steel tube that attached to the muzzle of the weapon and curved at a 30- or 90-degree angle. The deformity of the bullet coming out of the 90-degree version of the Krummerlauf degraded its performance and velocity to the point where it was deemed ineffective, but the 30-degree version went into limited production. The device was also fitted with a periscope. Its purpose was not readily apparent to the rare enemy who encountered it. The Krummerlauf was thought to be intended for street fighting, as the user could ostensibly see around corners in an urban environment. The truth is a little different, but not surprising. Considering the German reliance on armor in their order of battle and their experience with Russian antitank tactics on the Eastern Front, the Krummerlauf was actually designed to provide a way for the infantryman to fire his weapon from within the confines of an armored vehicle and to have a short but clear field of vision while doing so. The angularity of the firing device was intended to make it effective for sweeping an attacker off the outer hull of a vehicle, as the Germans had experienced Russian soldiers lying in wait and climbing on tanks and other vehicles to attach explosives. Hence, the bullet not only had to have a very short effective range, but a very unusual trajectory. 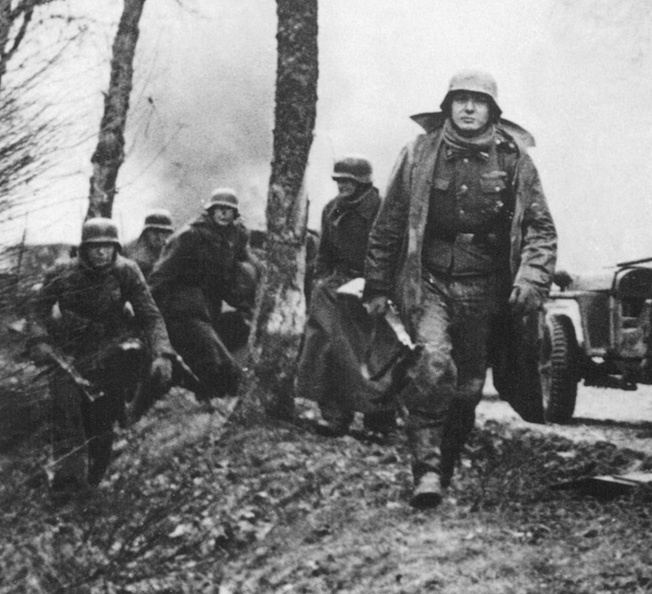 German troops stride past flaming American vehicles during the Battle of the Bulge. The soldier in the foreground carries a Mauser Kar 98 rifle, while the one at left holds a StG44 assault Rifle. Another revolutionary development that is now a staple of modern combat was the a night-fighting system designed for the MP-44. Nicknamed the Vampir, the cumbersome infrared targeting scope would allow the soldier to extend his combat operations to any hour of the day. The system consisted of a battery carried in a backpack configuration, a telescope (or sniper scope), and an infrared searchlight. While the Vampir system reportedly saw use in the waning months of the war, it was never widely distributed, and sources indicate that only some 300 of these units were made. Some more mundane accessories included sniper scopes and grenade launchers, which were employed to varying degrees of success, but it was found that the weapon functioned best when unimpeded and allowed to perform the task for which it was designed. Shortages of such necessary accessories as ammunition, magazines, magazine pouches, and slings and cleaning kits, which had been manufactured in abundance for prewar guns, plagued the users of the MP-44. Despite its limited proliferation (only about 80,000 were made) and its abbreviated combat life, the MP-44 nevertheless holds a historic place in firearms development as the world’s first select-fire assault rifle, not to mention the precedent it set as a weapons system. Although denied by Anton Kalashnikov, its influence on the design of the AK-47 assault rifle is readily apparent, and the MP-44 can still be found serving in many African and Middle Eastern armies and militias to this day. Brandt Heatherington is a freelance writer and collector of militaria living in Arlington, Virginia. He is a member of the Company of Military Historians and of several recreated military units. Tags Adolf Hitler, AK-47, Axis, M16, Nazi Germany, Spanish Civil War, Sturmgewehr, Treaty of Versailles.